From time to time, I wander into very different directions. Last week, on a whim, I decided to buy myself a Raspberry Pi Zero W with the pins soldered in (because while I technically have the capability of soldering the pins, my practice with soldering is practically nil). Also got a case, the joy bonnet (makes it like a game controller), and an mini HDMI adapter. And in the last few days, I have done things that I never generally do. I’ve burned images onto SD cards, I’ve dinked with config files. I’ve puTTY’d and sudo’d. Originally, I had been thinking python, and indeed I had been learning python and pygame. After the number of languages I’ve learned and used over the years, I give python the following summation: “it’s a module based language about scope and indentation level(really, the two things are identical in python), and a rather useful ‘in’ operator”, and I’m certain I will be glad I familiarized myself with it. With a few brief tutorials, the syntax for gcc is elementary, and after employing a well chosen makefile template unnecessary. So I now ssh over the network to the pi with puTTY, work in VIM with my .c files in tabs. It works fine, with an occasional :!make. I’ve got tmux on my list of things to get more familiar with. Mostly, I’m reminded of when I was using Turbo Pascal 5.5 in High School in 1991. No intellisense. No real debugger except printf statements. I even took a brief look at framebuffer coding. I cleared the screen white and gray. Normally, especially with my day job, I’m looking for a simple high level library that does all of my work for me. When I’m doing Pi stuff, I’m the exact opposite. I’ll certainly use a library. Heck, <stdio.h> is a high level of abstraction above the metal. But I like the low level stuff I get to do with ioctl. It dusts off a part of my brain that used to NEED to do these things. And it’s fun. Plus, I’m not afraid of gcc or VIM or gpio pins or debouncing. My coworker mentioned that I have all of the skills necessary to come up with a completely new arcade cabinet. I have woodworking tools. I have the ability to write code. I can wire up a breadboard to attach to joysticks and buttons to gpio pins. I don’t know where this is heading me, but I know I won’t be any worse off for doing these things. Yes, that’s right. JetLag 2017. Like all the other JetLags, but in 2017. Naturally, when I make a new JetLag, it means I’m exploring a new platform for development, and 2017 is no different. This years platform is Defold, a lua scripted scenegraph manager tool. It touts itself as the “Ultimate Engine For 2D Games,” which is a lofty ambition. Pedantically speaking, the world “ultimate” means the same thing as “final”, and non-pedantically, it means that there will never be a better one. Neither of these things are true, of course. This version of the game sits up there on GameJolt, right next to JetLag 2016, made with a similar tool, Godot. If you’ve followed my history at all, you will know that I’ve tried just about every tool there is, every platform there is, and most of the languages out there. You might ask the question, what am I looking for? I’m not actually looking for anything. Certainly, I’m not looking for the “ultimate” anything. I learn things as an end unto itself. Two years and three days. Yeah. Two years and three days since my last post. I’ve been busy with my day job, mostly, but that doesn’t mean I’ve neglected my game development. Since then, I put in a few Google Play games, one Ouya game. And now I’ve gone and entered a game jam, and I’m about to enter another. One that I did not use in the course of my job was AngularJS, though I had heard a lot about it, and there is a larger community and I figured at some point I should learn it. So after poking around, I wound up making Bottomless Pits and Potato Salad. And I am now looking forward to the text jam coming up in a few days. I’ve even started putting some of my old stuff up at itch.io. One of these days, I’m going to try out Quintus, too. And host the stuff on heroku. Splorr! Now has the ability to open and close doors! And I think I’m doing to stick with the tap-fest that is my UI. At first, I was thinking that I wanted to be able to have the player accomplish tasks with a low number of taps, ideally 1 tap for each action. Then I realized that I don’t, actually. Let the player tap seven times to perform an action. It’ll make him feel like he’s accomplished something. 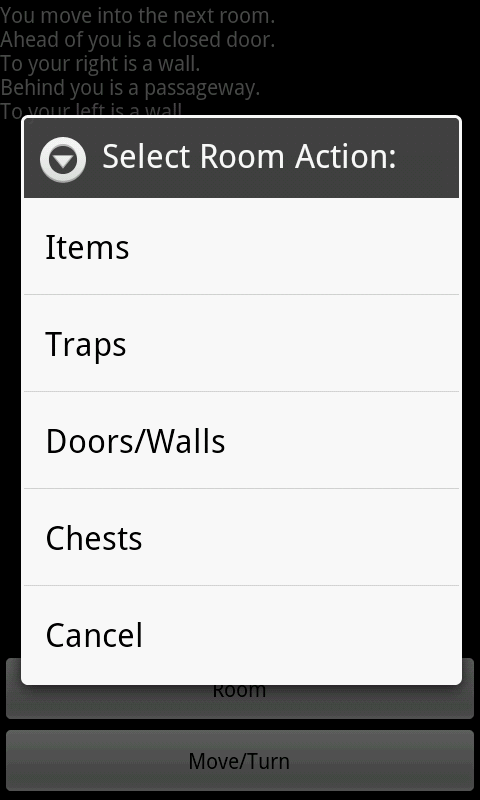 For example, I’ll take you through a typical action sequence upon entering a room. At the moment, I’m facing a wall, the door I just opened and went through is behind me, and there is a passageway to the right. I don’t want to go back to the room I was just in, so I decide to turn right and go through the passageway. 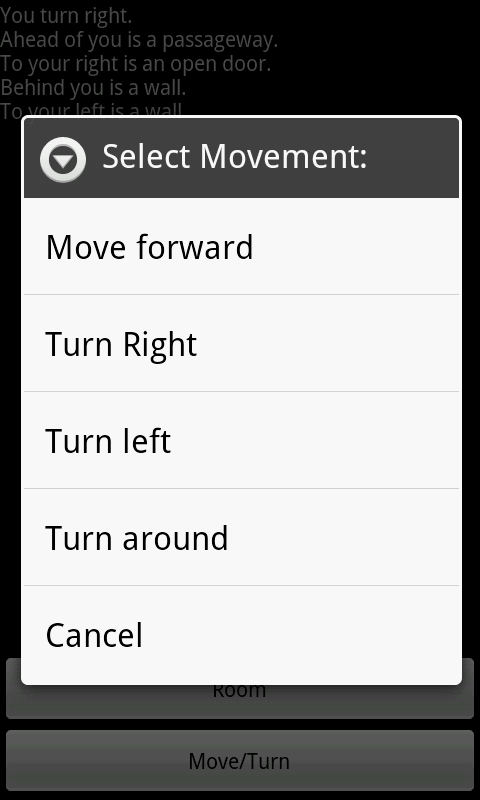 First, I tap the “Move/Turn” button. 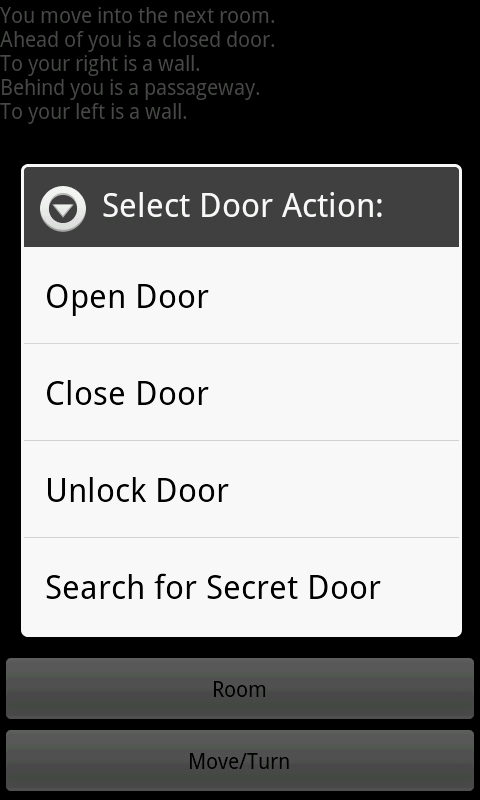 And finally tap “Open Door”. And so, the game becomes a bit of a micro-managing tapfest, but I think that’s what I want. Today I finally got Stock Market published. You can find the support page here. It has a the googl play badge. While still a long way from being highly engaging, these games are getting more complex as they get more “sophisticated”. However, I’m still not done with the “show some text and push buttons” genre. I am, however, rather sick of the games where the outcome of the game is totally random. I might as well be making a slot machine game (which is actually on the list, btw, but as a graphical game). Buy one stock of each type. Click “end turn” until the game is over. It isn’t like there is some data upon which to base how well a stock can do. Which means I may as well not bother making a choice at all. Games are about choices. Well, compelling games are about choices. Sometimes the only winning move is not to play. Next on the docket: Splore! Of course, it may not come out next, but I want to work on it next. I don’t really want to say too to describe Splore, or I’ll tend to have a lot of text written about a game that doesn’t exist. The basic idea is a text based HamQuest. So, I managed to get RR done today. Rather than my “one activity=one game state” idea that I used for GMN and RSP, I went with a single activity for everything, and using setContentView to change the UI for the states. Generally, it worked extremely well. The one edit text I was using (the one where you type in the number) first wouldn’t cause the soft keyboard to come up. Then the soft keyboard wouldn’t hide unless the “back” key was pressed. Eventually, figured it out, mostly by googling code until finding something suitable at stackexchange. Had to hide it myself. Not a big deal, but it was not something I had to deal with when it was one activity per page. Maybe that was the better way?